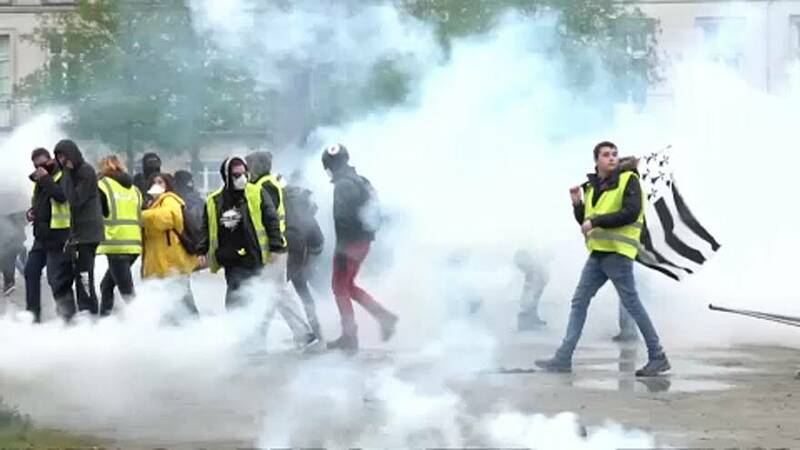 Police fired tear gas at "Gilets Jaunes" (yellow vest) demonstrators on Saturday (April 6) in the western French city of Nantes in another weekend of anti-government protests. The protests, named after the high-visibility safety jackets worn by demonstrators, started last November as an expression of public anger against fuel tax increases. The movement soon morphed into a broader backlash against President Emmanuel Macron's government, despite a swift reversal of the tax increases and other hurried measures worth more than 10 billion euros to boost purchasing power for less affluent voters. Despite the scuffles in Nantes, other demonstrations in major French cities remained calm on Saturday compared to recent weeks in part because of a high level of mobilisation of police. At 2 p.m. local time there were 6,300 demonstrating around France, with 3,100 marching in Paris, according to the French interior ministry.